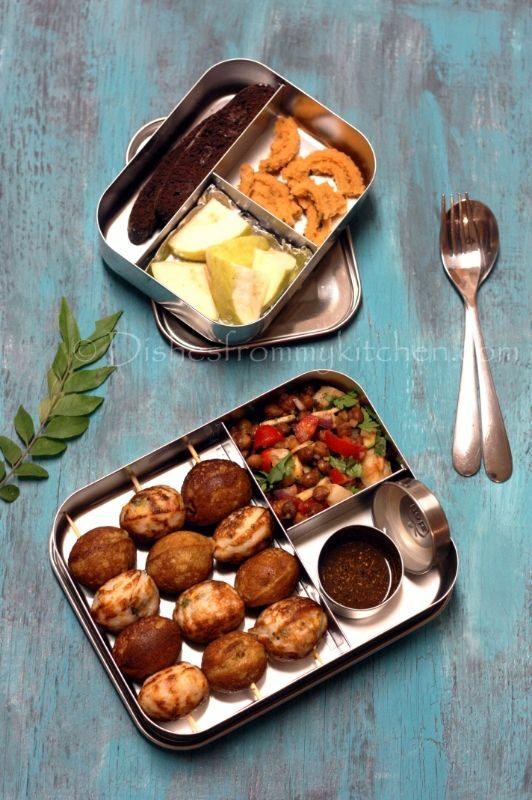 Dishesfrommykitchen: KIDS LUNCH BOX - PANIYARAM/ INDIAN EBELSKIVER ! 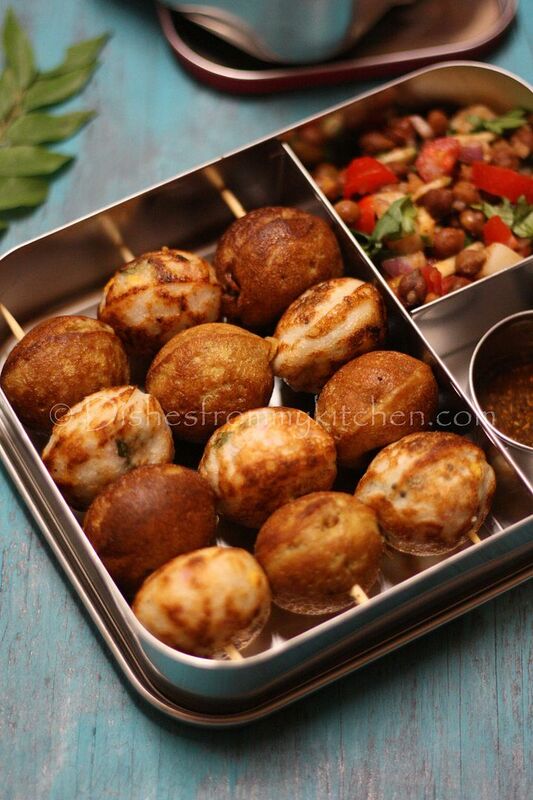 Paniyaram/ Gunta ponganalu (Indian Ebelskiver) is both kids and adult favorite. There are different method of doing this. Some do it using dosa batter by adding onions, coriander leaves, chillies, seasonings, soaked channa dhal etc. Other than that this another version you can do SAVORY PANIYARAM / KARAM PANIYARAM. But yesterday I made using dosa batter for savory version and for sweet made using CRACKED WHEAT/ SAMBA WHEAT RAWA (Version 1) and Jaggery. If batter is ready then you can pack lunch in no time... easy and delicious. 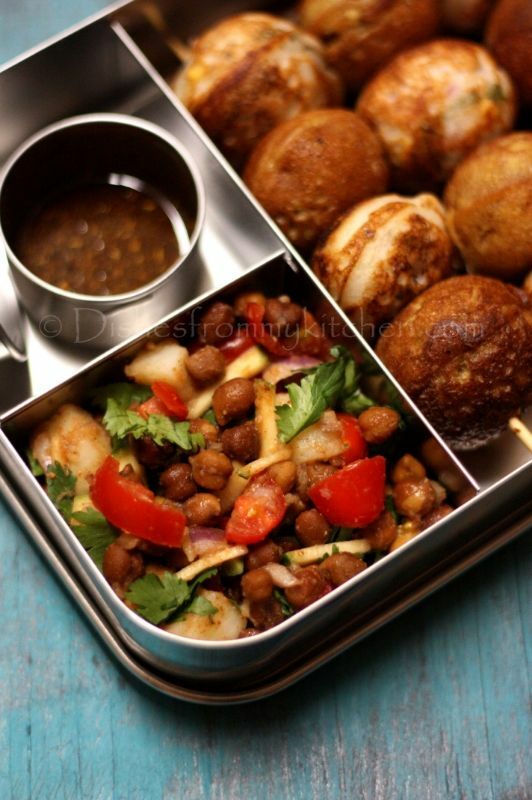 LUNCH BOX: SWEET AND SAVORY PANIYARAM/ /INDIAN EBELSKIVER, SPICE POWDER TO GO WITH SAVORY BALLS, BLACK GARBANZO/CHICKPEAS (CHAATPATTA) SALAD! 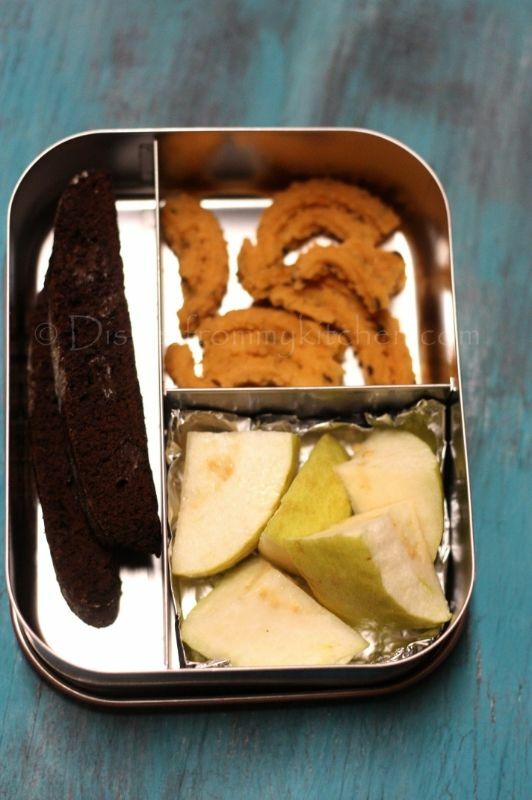 SNACK BOX: CHOCOLATE BISCOTTI, GUAVA AND INDIAN SAVORY SNACK/ CHAKRI /MURUKKU! SAVORY PANIYARAM (Other version which I did not make today), Make the same using regular DOSA OR IDLI BATTER you have. 1. Soak Black chickpeas overnight and pressure cook for 3 to 4 whistles. 2. Drain the water and keep it aside after pressure is released. 3. Mix everything in a bowl the vegetables, cooked chickpeas, seasonings. Mix well and garnish with Chopped cilantro. 1. You can make the same using other beans, white garbanzo also.